In one classroom, kids may be hooking up buddies to homemade lie detectors and comparing the noises that signal fibs versus whoppers. In another, children could be demonstrating Newton’s third law of motion by setting off Alka-Seltzer rockets. Whether they’re tending garden seedlings or navigating the mysteries of electronic circuitry, students involved in STEM Beyond School are going beyond hands-on learning. They’re finding out that science and math are fun. Better yet, they’re discovering these subjects can lead to dynamic careers. STEM Beyond School participants from the South County YMCA attend a robotics competition at South Umpqua High School. These are vital lessons in economically struggling communities, where families may find it hard to look beyond the daily challenge to keep their children fed. 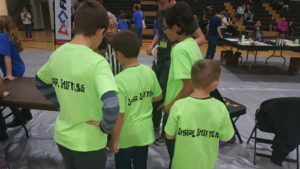 Funded by the Oregon Department of Education, STEM Beyond School provides grants to eligible agencies and programs that enables them to operate free after-school STEM activities. In Douglas County, programs are ongoing through two hosts: the South County YMCA in Canyonville and Great Afternoons in Reedsport. Both sites are in the process of forming community partnerships with businesses, nonprofit groups and others to strengthen the program. Each site also includes field trips in its curriculum to meet grant stipulations. At Canyonville School, STEM Beyond School was a perfect match for an existing after-school program for two age groups – grades K-3 and grades 4-8, said Christine Turvey, branch director of the South County YMCA. About 50 children are currently enrolled in the program that takes place from 3:30 to 5 p.m. Mondays through Thursdays. In her goal to ease students into the role of “citizen scientists,” Turvey said subject matter is dictated in part by the season. Fair-weather days found kids outside, in the schoolyard and a field trip to Alder Creek Community Forest. 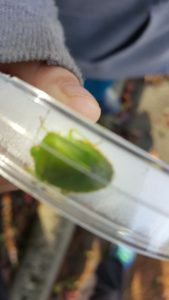 They collected insects to identify, measured soil temperatures and took a hike through various plant habitats. Students from the South County YMCA’s STEM Beyond School program are seen enjoying a hike in Alder Creek Community Forest. As fall drew on, studies switched to topics that could be pursued indoors, such as the solar system. The curriculum included discussion of Pluto’s demotion to dwarf planet status and why our white sun looks yellow. As in Canyonville, the Reedsport STEM Beyond School program is structured in two age groups, although activities were blended initially. Curriculum for seventh- and eighth-graders started in November, and students from grades 4 to 6 began meeting in January. It’s coordinated by Chris Marsh, program director for Great Afternoons, a sliding-scale day care service that’s affiliated with the nonprofit agency Oregon Coast Community Action. Marsh said she’s been recruiting STEM Beyond School participants by asking students she thought might be interested in the after-school activities. She started with five kids and hopes eventually to expand to 30. Programs are held on Reedsport School District property, although Marsh expects to plan field trips and other outings through the year. As in Canyonville, cost is free to all participating families. Chemistry, robotics and coding were some of the topics Marsh mentioned as options for curriculum. 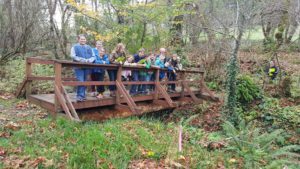 Possible field trips could include visits to the Reedsport Discovery Center or a site where children can learn about the Salmon and Trout Enhancement Program operated by the Oregon Department of Fish and Wildlife. But whatever her ideas, March said she plans to pursue activities that are of most interest to the students. “We really want kids to direct the program,” she said. Current funding for STEM Beyond School expires Aug. 31, but it may be extended, according to Grace Goodson, the program’s southwest regional coordinator. She’s also the project coordinator for the Umpqua Valley STEAM Hub, which helped bring program funding to the two Douglas County sites. Organizers hope future funding will be available to expand similar programming to other sites. Goodson said that even if the grant is limited to one year, participants will gain news skills they can carry forward, such as establishing learning connections with other partners. Students meanwhile will gain confidence in STEM subjects, she added. “We’ve had some kids who were misbehaving who are now listening, paying attention and following directions,” she said. “Older kids are helping younger kids with their homework and other fun activities, thus giving them some leadership skills,” she said. In Reedsport, Marsh said one of the benefits of STEM Beyond School is that it adds lesson plans that aren’t always possible in regular school curriculums. It also introduces the concepts of post-secondary education to children who may come from a background of generational poverty. “This kind of program not only gets kids interested in how things work, it makes them look at how they can take this learning beyond, to college and a career,” Marsh said. For more information, contact Christine Turvey at 541-957-4216 or cturvey@ymcaofdouglascounty.org, or Chris Marsh at 541-271-3926 or cmarsh@reedsport.k12.or.us.